← Meeting Jewelry Designer Kendra Scott!!! My friends said “You look like a rocker girl today!” This outfit was DEFINITELY werkin’!!! (“Werk” with an “e” because it’s more fierce than just ‘work.’) I told you I’d post my outfit with the Skylar Earrings that I got from my special day with Kendra Scott. Here it is!!! 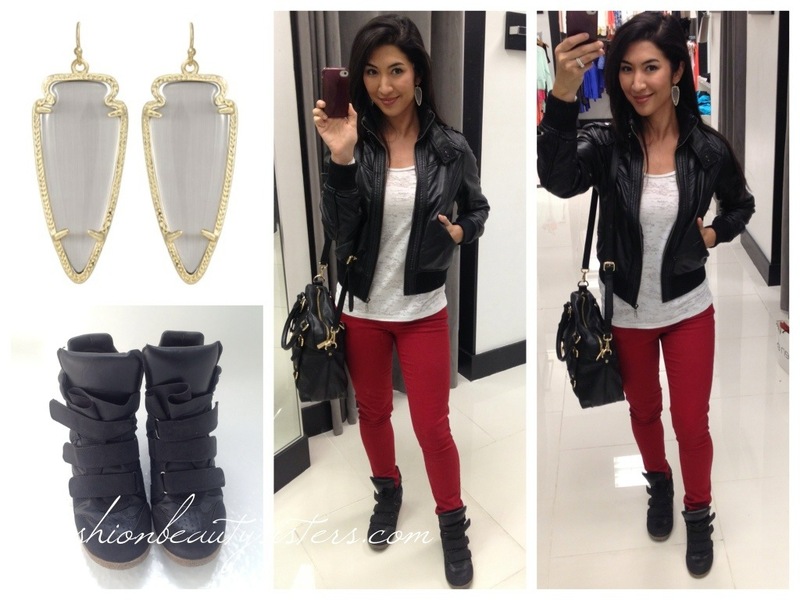 Above: EARRINGS: Kendra Scott, Skylar in Slate // JACKET: Leather moto jacket I found at a great shop in Rome, Italy! You can find plenty of style stealers at Zara // SHIRT: Target // PANTS: Old Navy, Rockstar in Curry // SHOES: Target // PURSE: Michael Kors, Bedford Satchel. Above: Miranda Kerr, Julianne Moore, Hilary Duff (I adore her! ), and Anne Hathaway. Consider this a celeb look for less post, because the hidden wedges I’m wearing look just like the celebs’ and they are super comfy. Enjoy this trend!